Bad Photoshop Sunday presents: Frankly, Jim, I don't give a damn! This will be hard to top, but if anyone can do it, YOU are the man. Agreed, but that bottom Picard face got belly laughs out of me. I dunno, it must be the angle of his head, and the expression. That bottom frame is a definite keeper. It could work as a single - but I would swap out Kirk for someone sillier. And give him/her a bit more profile (face in the frame). Btw, I'm gonna grab this one and mangle it also - if you don't mind. It looks like fun. Data is looking good - thanks for sharing! What would make that look work? It's probably a lot easier when you can 'shop' whatever is needed. I'm usually restricted to big blocks. Not worth the hours of effort for me to cut something out well enough. If it were my project, I would contrast the text with Data's face. For me, the gray blends a little too much. Your mileage may vary. I used to work with a guy who turned down the thermostat for the same effect. Those were the days! Remember the scene with the Martian woman that had three "hand warmers"? I thought they did a pretty good job on her prosthetic. Wasn't there also one in a ST movie or SW? Hilarious!...now what was that combination? The planet of intergalactic peace? I thought they built that up to more than it delivered. OMG, she's got nice texts! TBH, I missed that pun originally. Took it literally - I must have been distracted. Cross reference: How do I tell Magneto how I really feel? That is PERFECT! ...and a bit of a touche my friend :-) Another btbeeston MASTERPIECE and possibly my next submission, with full credit of course. 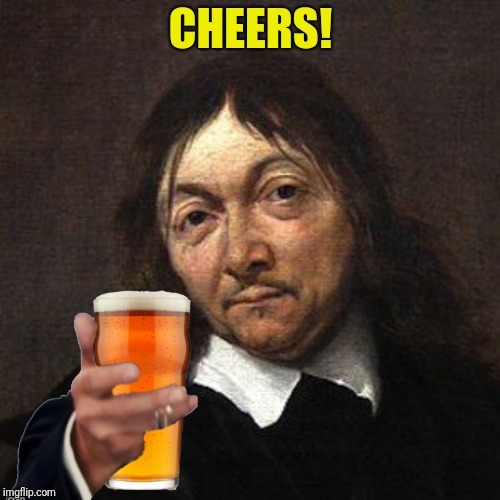 Stay safe tonight my friend, keep your friends close and your beers closer! Please note - this is me. Since I have enough templates, I will use only the ones I have already. That will leave only *others* to ask, so there will be no confusion. 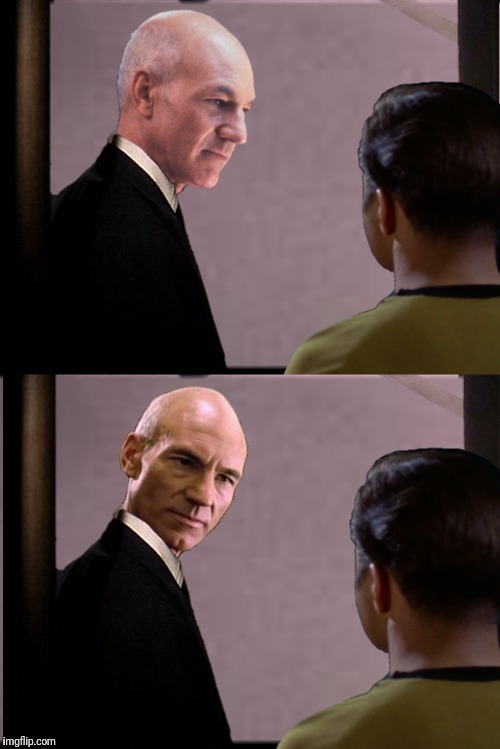 Did you notice this line in the response below the Picard/Mountain Dew meme? >> "Unless you say otherwise, I'll assume you don't mind if I continue to use your images that I might find here and there." Unless you say otherwise, I'll assume you don't mind if I continue to use your images that I might find here and there. I may be a bit mischievous and play with words and images, unfortunately I was just called a troll for that by nottaBot! He can be a bit of a meanie, but I would never say that about him. Why are you responding to the troll? Please read the account name carefully for best results. I have done nothing but be nice and helpful while having a little fun. The thanks I get for that is being called a troll? 1,2,3,4 I declare a meme war! 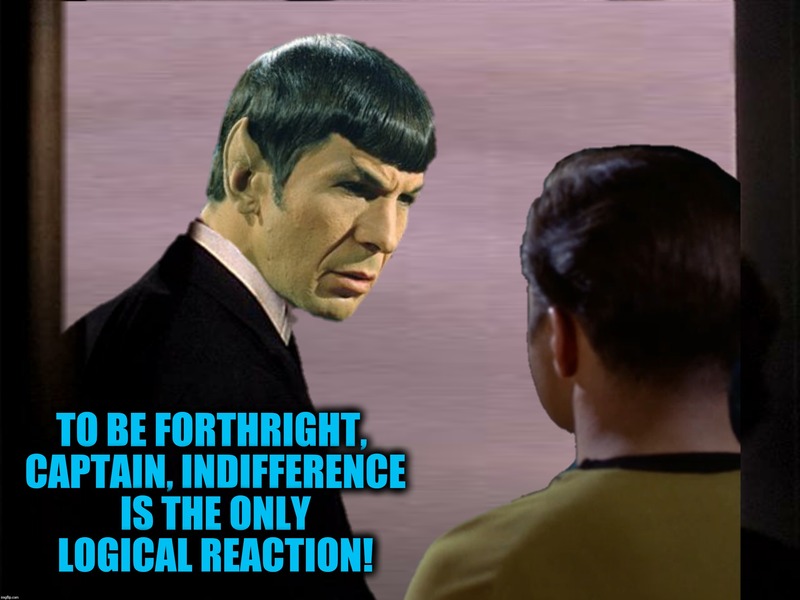 TO BE FORTHRIGHT, CAPTAIN, INDIFFERENCE IS THE ONLY LOGICAL REACTION!